DOROTHY A. MAY (nee Smiley), of Solon. Age 88. November 11, 1930 – November 25, 2018. 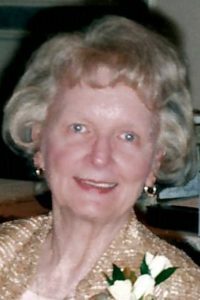 Beloved wife of James A. for 66 years; loving mother of Robert A. May, Sally (Adam) DeFrancesco, Philip O. (Nicole) May and the late Maureen E. May; cherished grandmother of Danielle, Gabrielle, and Austin DeFrancesco and Sara and Brendan May; dear sister of Raymond E. Smiley (Eleanor); dearest aunt to 8 nieces and nephews, and friend to many. Mass of Christian Burial Saturday December 1, 10AM at St. Rita Church, 32820 Baldwin Rd., Solon. Interment Roselawn Cemetery. Family will visit with friends at STEINBAUER FUNERAL HOME, 33375 BAINBRIDGE RD., SOLON, FROM 2-4 AND 6-8 PM FRIDAY NOVEMBER 30. In lieu of flowers memorials may be made to Regina Health Center, 5232 Broadview Rd., Richfield 44286 or Hospice of the Western Reserve, 300 East 185th St., Cleveland 44119.